There are those who would insist that palynology, and hence also paleopalynology, applies only to pollen and spores or, more specifically even, only to pollen and the spores of embryo-producing (embryophytic) plants. 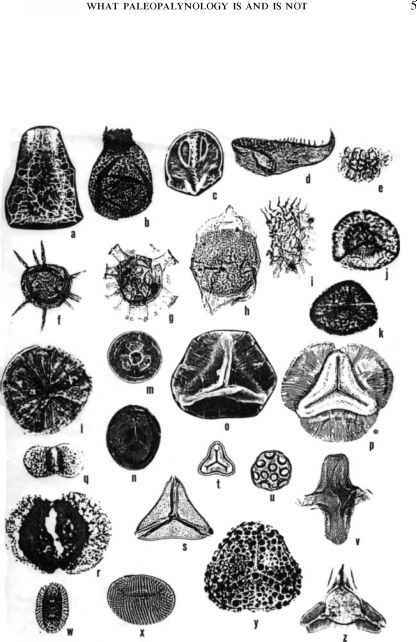 And it is true that Hyde and Williams (l944) had that in mind when they coined the term palynology, a word from the Greek ^a\vvM ("I sprinkle"), suggestive of "fine meal," which is cognate with the Latin word pollen ("fine flour," "dust"). However, that is not the way most paleopalynologists use the term. Instead, they use a pragmatically based working definition, saying in effect that paleopalynology consists of the study of the organic microfossils that are found in our maceration preparations of sedimentary rocks, i.e. "What my net catches is a fish." This means palynomorphs, the microfossils which are the subject matter of this study, consist at least partly of very resistant organic molecules, usually sporopollenin, chitin or "pseudochitin" (there are some few exceptions). Palynomorphs are also by common consent in the approximately 5-500 ^m(= micrometer = micron = size range. Many megaspores are larger, and some "seed" megaspores of the late Paleozoic are much larger. Species of Tuberculatisporites are reported by Potonie and Kremp (1955) to be 3000 ^m(= 3 mm! ), and Cystosporites megaspores are even larger-3 x 8 mm (Schopf, 1938). From my pragmatic point of view, such huge spores are beyond the pale of palynology-in megafossil paleob-otany. That is not meant in any way to denigrate the study of megaspores! On the other hand, nannofossils are not palynomorphs on two scores. First, they are calcium carbonate (CaCO3) and hence are destroyed by the dilute hydrochloric acid (HCl) we usually employ as a first treatment in palynological maceration of sediments. Secondly, they are also too small, prevailingly less than 5 ^m. Diatoms are not palynomorphs, although they are in the right size range, because they are usually siliceous and destroyed by the hydrofluoric acid (HF) that is the major weapon in the paleopalynological armory. The same is true of phytoliths, usually consisting of silica or calcium oxalate, produced typically by grasses and sedges. They are very useful in various forms of environmental reconstruction (cf. Meunier and Colin, 2001; Piperno, 2001; Piperno and Stothert, 2003). These are also in the correct size range but are dissolved by the acids in conventional palynological maceration. A curious oddity is the report of spores and pollen that are apparently permineralized and lack residual sporopollenin (Srivastava and Binda, l984). According to my definition, such fossils, though spores and pollen, are not palynomorphs, because they would not appear in palynological residues prepared with hydrochloric and hydrofluoric acids! Another problem with my definition is typified by work such as that of Butterfield (2005), in which chips of sedimentary rocks are very carefully and gradually treated with hydrofluoric acid, with no crushing of the rock fragments, no centrifugation, as little agitation as possible, no harsh chemicals other than the HF, and handpicking of the very fragile specimens out of water with pipettes and other tools. An illustration of a very delicate late Proterozoic specimen obtained in this manner is displayed here as Fig. 1.1 (see also comments in Appendix, under decantation methods). Work with such specimens is certainly marvelous paleontological science and very important, but their study is not strictly speaking part of paleopalynology, because the fossils are not robust-walled and therefore are not "fish caught by our nets." Our subject depends on obtaining whole assemblages of abundant, at least relatively robust-walled specimens, data from which we use for stratigraphy, paleoecology and related matters. This is just a fact and does not denigrate the importance of fossils such as the Tappania specimen illustrated, in conjunction with paleopalynological studies. Figure 1.1 How to qualify as a palynomorph. (a) Tappania sp., from late Proterozoic rocks of northwestern Canada. This beautiful but very delicate organic microfossil of possible fungal origin was recovered by Butterfield (2005) by HF digestion of the rock with no agitation, no centrifugation or other chemical treatments routinely employed in paleopalynology. I processed a sample of the same rock given me by Butterfield, using ordinary paleopalynological techniques and obtained no palynomorphs. Technically, the specimen illustrated here does not qualify as a palynomorph, because it is not robust-walled. That does not detract from its great interest as a fossil. Photo courtesy of N. J. Butterfield. (b) Arcella artocrea Leidy, a testate amoeba. Holocene peat, Michigan. Tests of this species and some other such amoebae are proteinaceous and moderately resistant to basic palynological processing: centrifugation, the acids used in maceration, etc. At least some testate amoebae are therefore palynomorphs which can be usefully studied for information about environments of deposition, especially of lakes and ponds. Tests of other species of the group are not robust and would not qualify as palynomorphs. Specimen 190 |xm in diameter. Photo courtesy of R. K. Booth. (c) Zygospore of Mougeotia sp., a zygnemataceous green alga from late Pleistocene of the Netherlands. This algal zygospore contains enough sporopollenin to render it somewhat robust-walled. Zygnemetaceous zygospores are typical of some fresh-water sediments and although rather atypical both taxonomically and environmentally, they are definitely palynomorphs. Specimen 45 |xm in maximum dimension. Photo courtesy of Bas van Geel. Palynodebris is organic "junk"=organic matter ("OM") found in palynological preparations along with palynomorphs, even though not consisting to any significant extent of sporopollenin or chitin. Some of it is more or less structured plant material, such as charcoal or even cellulosic tissue fragments that escaped hydrolysis or acid digestion. Some of it is amorphous ("AOM"). Palynodebris is now an important subject matter of paleopalynology for its relevance to questions of palynofacies/environment relationships. Charcoal in particular is a very abundant and frequent constituent of palynodebris and can be analyzed as to quantity and type, potentially revealing much about the environment at the time of deposition (see Whitlock and Larsen, 2001). There is a small problem related to the "paleo" part of our subject's title. That means that paleopalynology deals specifically only with palynomorphs that are fossils. I take a very liberal view of what constitutes a fossil palynomorph, defining it as any body that answers to the requirements given above for palynomorph, and which comes from some sort of sediment or debris in the earth's crust, representing past life. How far past? I don't think that is worth arguing aboutI would regard pollen, spores, dinocysts found in any sample of the earth's crust, including spores found in surface sediment, water or ice as fossils. The current edition of the AGI Glossary of Geology (Neuendorf, 2005) only insists that fossils represent the geologic past, but that includes yesterday as well as the Precambrian. I therefore reject as hair-splitting the term "subfossil," which is defined in the same Glossary as being what would otherwise be a "true" fossil, but is less than 6,000 yrs. old. It is self-evident that paleopalynology, but not other aspects of palynology, is a subset of micropaleontology and thus of paleontology. Fig. 1.2 illustrates the common sorts of palynomorphs, and Fig. 1.3 presents the range in time of the various categories of fossils. See also color illustrations of palynodebris later in the book. The word palynology should be pronounced pal-ih-nol-o-jee. The first "a" is pronounced as a in map. Avoid "pahl..." or "pohl...", as if directly taken from the word pollen. Avoid also "pail...", suggesting by the beginning of the word that it comes from "paleo-", as in paleontology. That restriction applies to paleopalynology, but not to branches of palynology such as the morphology of modern pollen. The textual material that follows describes the categories of things included in the subject paleopalynology, more or less in order of stratigraphic appearance. Figure 1.2 Palynomorphs of various categories and geologic ages, illustrated by photomicrographs (PM) (= transmitted light, made with a light microscope-LM), microphotographs (MP) (= reflected light, relatively low power), scanning electron micrographs (SEM) and line drawings. All major categories of palynomorphs are included: "microforams," chitinozoans, scolecodonts, colonial algae, acritarchs, dinoflagellates, cryptospores, isospores, microspores (cannot be distinguished on morphology alone from isospores), megaspores, pollen, and fungal spores. Because the fossils come from many sources and represent specimens in many different size ranges, the magnification varies considerably. Approximate size of each specimen is indicated in micrometers, except that a bar is provided for the fungal spores (ai)-(an). (a) Chitinozoan: Herochitina sp., Upper Ordovician, England. SEM by W. A. M. Jenkins, length 200 |xm. (b) Chitinozoan: Kalochitina multispinata Jansonius. Upper Ordovician, Oklahoma. PM by R. W. Hedlund, length 150 |xm. (c) Scolecodont: Xanthoprion albertensis Jansonius and Craig. Dorsal view of partial apparatus. SEM by J. Jansonius, length 350 |xm. (d) Scolecodont: Arabellites sp., Upper Ordovician, Oklahoma. PM by R. W. Hedlund, length 150 |xm. (e) Colonial alga: Botryococcus sp., Oligo-Miocene, New South Wales, Australia. PM, length 40 |xm. (f) Acritarch: Baltisphaeridium sp., Upper Ordovician, Oklahoma. PM by R. W. Hedlund, diameter 100 |xm. (g) Dinoflagellate cyst: Hystrichokolpoma unispinum Williams & Downie, Lower Cretaceous, Ellef Ringnes Island, Arctic Canada. PM by C. J. Felix, diameter 85 |xm. (h) Dinoflagellate cyst: Deflandrea granulifera Manum, Upper Cretaceous, Ellef Ringnes Island. PM by C. J. Felix, length 120 |xm. (i) Algal coenobium (special kind of colony): Pediastrum sp., Upper Pleistocene, Black Sea. PM, length 50 |xm. (j) Spore: Retispora lepidophyta (Kedo) Playford (= Spelaeotriletes lepidophytus (Kedo) Keegan, Uppermost Devonian, Pennsylvania. PM, diameter 70 |xm. (k) Spore: Rugospora flexuosa (Jushko) Streel, Uppermost Devonian, Pennsylvania. PM, diameter 70 |xm. (l) Spore: Emphanisporites robustus McGregor, Upper Devonian. PM by R. W. Hedlund, diameter 65 |xm. (m) Spore: Knoxisporites stephanephorus Love, Upper Mississippian, Oklahoma. PM by C. J. Felix, diameter 55 |xm. (n) Spore: Calamospora sp., Uppermost Devonian, Pennsylvania. PM, diameter 70 |xm. (o) Spore: Reinschospora speciosa (Loose) Schopf, Wilson & Bentall, Upper Mississippian, Iowa. SEM by J. B. Urban, diameter 65 |xm. (p) Spore: as (o), Carboniferous. Line drawing by R. Potonie (Potonie and Kremp, 1954, p. 139) adopted as trademark of Catalog of Fossil Spores and Pollen. (q) Pollen grain: Pityopollenites pallidus Reissinger emend. Nilsson, (al. Vitreisporites and Caytonipollenites), Upper Triassic, Texas. PM, length 30 |xm. (r) Pollen grain: Platysaccus nitidus Pautsch, Upper Triassic, Texas. PM, length 55 |xm. (s) Pollen grain: Expressipollis ocliferius Khlonova, Upper Cretaceous, Ellef Ringnes Island, Arctic Canada. PM by C. J. Felix; diameter 65 |xm. (t) Pollen grain: Expressipollis accuratus Khlonova, Upper Cretaceous, Ellef Ringnes Island. Compare with (s)-forms referred to the same form-genus of dispersed spores are often very heterogeneous. PM by C. J. Felix, diameter 30 |xm. (u) Pollen grain: Kuylisporites lunaris Cookson & Dettman, Middle Cretaceous, Lougheed Island, Arctic Canada. PM by C. J. Felix, diameter 40 |xm. (v) Pollen grain: Aquilapollenites trialatus Rouse, Upper Cretaceous, Alaska. PM by C. J. Felix, length 95 |xm. (w) Pollen grain: Wodehouseia spinata Stanley, Upper Cretaceous, Alaska. PM by C. J. Felix, length 50 |xm. (x) Spore: Schizaeoisporites sp., Middle Cretaceous, Oklahoma. PM by R. W. Hedlund, length 50 |xm. (y) Spore: Trilobosporites sphaerulentus Phillips and about 30 ^m in diameter. Some palynologists follow Diver and Peat (1979) in separating off such bodies lacking spines, plates or other features suggesting algal affinity as cryptarchs (see Glossary and later discussion). However, it is as yet more common to include the types in the one category, acritarch. Acritarchs range to the present time, but their greatest significance and high point of abundance was reached in the early Paleozoic. 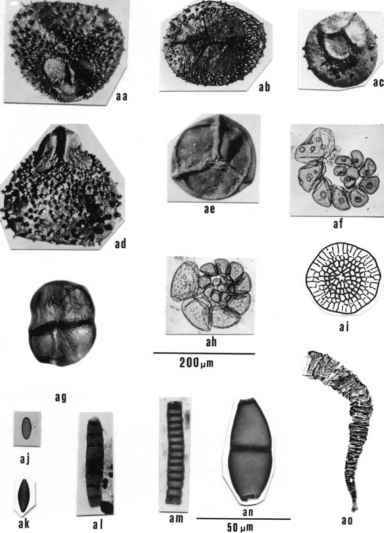 Tappan (1980) shows that, after the early Jurassic, spiny acritarchs are rare and unimportant, and though leiospheres and some other forms continue to the present, acritarchs as a whole are not an important factor among extant phytoplankton. The statement in Pflug and Reitz (1985) that acritarchs "... finally disappear in the Pleistocene" is, however, too extreme. There are even some leiospheres and acanthomorphs in modern sediments. Figure 1.2 Felix, Lower Cretaceous, Louisiana. PM by C. J. Felix, diameter 80 |xm. (z) Pollen grain: Nudopollis sp., Paleocene, Gulf Coast, USA. PM by R. W. Hedlund, diameter 30 |xm. (aa)-(ae) MP of megaspores; sizes are approximate. (aa) Lagenicula acuminata (Dijkstra) Dybova-Jachowicz et al., Lower Carboniferous, Moscow Basin, Russia, 1, 800 |xm. Proximal view showing prominent contact structure or gula. Although the parts of the gula look as though they could represent aborted spores, they are actually expanded contact faces. (ab) Tuberculatisporites mammilarius (Bartlett) Potonie & Kremp, Carboniferous (Westphalian), Belgium. 1, 800 |xm. Proximal view showing laesura and contact faces. (ac) Triletes grandispinosus Dijkstra, Lower Carboniferous, Moscow Basin. 1, 100 |xm. Proximal view, showing trilete laesura with curvaturae perfectae and contact faces. (ad) Triletes acuminata (Dijkstra) Dybova-Jachowicz et al., Lower Carboniferous, Moscow Basin. 1, 800 |xm. Lateral view for comparison with (aa). Note prominent proximal gula (see comment under (aa)). (ae) Triletes patulus Dijkstra, Lower Carboniferous, Moscow Basin. 800 |xm. Proximal view showing trilete laesura and contact faces. Raised figure of laesura has characteristic flaps near center which are sometimes called "tecta." (af) PM of the chitinous inner tests of spiral foraminifera, recent sediment, Great Bahama Bank. Size indicated by bar under (ah). (ag) Cryptospore: cf. Pseudodyadospora sp., Lower Middle Ordovician, Saudi Arabia. Maximum dimension 35 |xm. (ah) PM of the chitinous inner tests of spiral foraminifera, recent sediment, Great Bahama Bank. See also (af). (ai)-(ao) PMs of chitinous palynomorphs of fungal origin. Magnification as shown under (an). (ai) Drawing of characteristic flattened, multichambered, fruiting body (ascostroma) of a sort produced by some ascomycetes. Asterothyrites sp., Cenozoic (from Elsik, 1979). (aj) Small, non-aperturate fungal spore, recent sediment, Gulf of Mexico. (ak) Small diporate fungal spore, Pleistocene, Black Sea. (al) Chain of fungal spore units, with characteristic thickenings on septa, Pleistocene, Black Sea. (am) Chain of fungal spore units, with very thick septa, recent sediment, Gulf of Mexico. (an) Diporate, two-celled (septate) fungal spore body, Pleistocene, Black Sea. (ao) Organic-walled tentaculite zoomorph, Late Devonian, Poland. Maximum dimension 400|xm. (cf. Wood et al., 2004). a-z reprinted by permission from Traverse, 1974a; aa and ac-ae reprinted by permission of Rijks Geologische Dienst, Heerlen, The Netherlands, from Dijkstra and Pierart, 1957; ab reprinted by permission from Pierart, 1955. (Figs. 1.2a,b. Range: Late Cambrian to Latest Devonian.) These are pseudo-chitinous palynomorphs for which there have been several suggestions as to the source organisms. One of these is graptolites (see Jenkins, 1970), for which relationship the arguments are circumstantial but interesting (chemical similarity, frequent association, close agreement in stratigraphic limits). The suggestion of fungal relationship (Loquin, 1981) seems improbable. The best known experts on the groups at present (Paris et al., 2004) will go only so far as "...eggs of soft-bodied marine metazoans." They first appear in Cambrian rocks, are most abundant in the Ordovician and become extinct by the end of the Devonian time. They are found only in marine rocks, unless reworked. They sometimes occur in chains, but usually as single "individuals." Because of their thick, more or less opaque walls, they are usually best studied by scanning electron microscopy (SEM), although LM study of broken surfaces frequently reveals important structural details. Because they are not present in the abundance often seen for spores/pollen and acritarchs (about 102/g range instead of 103-105/g range), larger samples must be processed. For this reason and because large specimens are easily broken, somewhat different processing techniques must be employed. (Figs. 1.2c,d. Range: Lower Ordovician (Arenigian) to present.) These are chitinous mouthparts of polychaetous, mostly marine annelid worms. Although they range from Cambrian to the present, they have been mostly studied in Paleozoic rocks. As is true of chitinozoans, scolecodonts mostly occur in the range up to 102/g and require different processing techniques from those for spores/pollen, though fragments are frequently encountered in slides from conventional macerations. As pointed out by Jansonius and Craig (1971), the mouth-lining parts from one worm may exist united or dispersed, and the dispersed parts may not all be alike. The taxonomy is therefore difficult. (Figs. 1.2e,i. Range: Ordovician to present.) Botryococcus (Fig. 1.2e) is a colonial alga occurring in a wide range of freshwater to brackish aquatic environments. The walls of the colonies that are preserved apparently consist partly of hydrocarbons; the hydrocarbon "mineral," coorongite, consists largely of Botryococcus colonies. There is some evidence that the walls also contain sporopollenin. Although I once described a "new species," I now regard all Botryococcus colonies as representing B. braunii Kutzing, which would be, if this is correct, a candidate for the oldest surviving species of Plantae, ranging from Ordovician to the present. 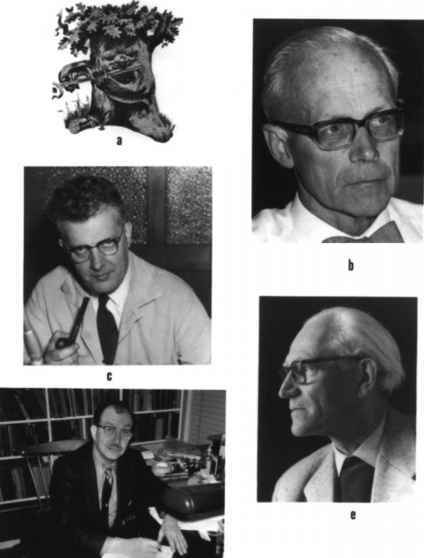 Niklas (1976) has shown Botryococcus, both extant and fossil, to possess an extraordinarily diverse suite of organic compounds. Stratigraphically and paleo-ecologically almost worthless, Botryococcus must nevertheless be treated here, as it is found so commonly in palynological preparations. The other principal "colonial" alga occurring as a palynomorph is Pediastrum spp. (Fig. 1.2i), the various species of which range from early Cretaceous to present. Although it is multicellular, it is more precise and technically correct to call it a green algal coenobium, as the number of cells is fixed at the origin of the organism. The resistance to biodegradation of Pediastrum is one of the puzzles of palynology. The wall seems to be fairly delicate and cellulosic and should be hydrolyzed quickly. Obviously the walls must be impregnated with something additional, presumably sporopollenin The various species of Pediastrum are all freshwater forms. Sporopollenin-containing microscopic parts of various green algal forms such as Zygnemataceae zygospores (see Fig. 1.1) and Prasinophyceae phycomata (see Fig. 12.1 and associated text) are found occasionally as constituents of terrestrial and near-shore marine sediments of Paleozoic to present age. For an introduction to various other microscopic algal bodies that appear from time to time as palynomorphs, see Colbath and Grenfell (1995) and Van Geel (2001). Prasinophyte algal phycomata such as the tasmanitids are also commonly found algal palynomorphs (see Fig. 12.1). (Fig. 1.2a-g. Range: Cambrian to Silurian.) Cryptospores are spore-like bodies in the normal spore size range, with walls containing sporopollenin, but lacking the haptotypic characters, such as a trilete laesura, that typify true spores. Cryptospores presumably are spore-like reproductive bodies of plants representing an intermediate stage between aquatic algae and land plants. Some of the producing plants may well have been comparable to modern bryophytes, especially to liverworts. (Figs. 1.2j-p, x,y. Range: Upper Ordovician to present.) Embryophytes are all plants that make true embryos in their life cycle: Bryophyta, Pteridophyta, and all seed plants. Embryophytic plant spores actually include pollen, in the sense that the exines of pollen we study as sporomorphs are the microspore walls of seed plants (see Pollen below, and presentation of life-cycles in Chapter 4). However, for palynologists, "spore" as usually employed refers to sporopolleninous microspores and homospores (= isospores) of embryophytes. Embryophyte pollen, megaspores, and fungal spores are thought of as "different," despite the fact that pollen and free megaspores are sporopolleninous and clearly are part of the same category as "spores." Fungal spores are equally clearly another story, as the fungi are more closely related to animals than to plants. (Figs. 1.2q-w, z. Range: latest Devonian to present.) The definition of pollen is not morphological but functional: the microspore wall of seed plants, plus the microga-metophyte that develops within the wall. Only the outer microspore wall survives as a fossil. The earliest pollen grains were not at all different morphologically from isospores or microspores, and they had haptotypic features like a spore and even germinated proximally like a spore in order to release their gametes. Such pollen is called "prepollen" (Chaloner, 1970b). We would not realize that they are pollen except for the fact that they are known from paleobotanical investigations to be the fecundating element of seed plants. Later gymnosperm, and especially angiosperm, pollen differ markedly in morphology from spores. Chemically, the walls are apparently the same, that is, sporopolleninous. Biologically, a whole mature pollen grain represents a plant generation and is therefore, in a sense, a haploid plant. In fact, whole (haploid) plants can be grown in culture from a single pollen grain. Nitzsch and Nitzsch (1969) produced tobacco plants by culture from single pollen grains. The plants mature normally and flower but, as they are haploid, they do not undergo meiosis properly and cannot set seed. (Figs. 1.2g,h. Range: (Cambrian? )-Late Triassic to present.) Sporopolleninous cysts of dinoflagellates are common from Late Triassic rocks to present, mostly in marine environments, but also in sediments deposited in fresh and brackish water. The range problem indicated above has to do with the difficulty of proving that a given cyst is a dinoflagellate. This requires certification of the presence of dinoflagellate-type archeopyle-operculum, and/or dinoflagellate plates and related morphological features. Many Paleozoic cysts from as early as the Cambrian may be of dinoflagellates, but the required proofs are not present in sufficiently convincing manner. Molecular and other chemical studies in recent years strongly support pre-Triassic existence of the group (see Hackett et al., 2004). On the other hand, many brackish-water or freshwater dinoflagellate cysts are more or less featureless "bags" that require examination of thousands of specimens to prove that a dinoflagellate made them, e.g., in Black Sea Deep-Sea Drilling Project (DSDP) cores (see Traverse, 1978a). (Elsik, pers. comm., 1981) commonly produce chitinous walls in hyphae or spores, permitting preservation as maceration-resistant fossils. There are some Permo-Triassic exceptions, but they are scarce as a rule. An alleged "spike" of them in some places near the Permian/Triassic boundary (see Steiner et al., 2003) has been challenged on the basis that the "fungal fossils" are probably algal (Foster et al., 2002), but a spike of fungal spores and hyphae at or near the Cretaceous/Cenozoic boundary, probably as a result of huge volumes of dead vegetable matter (Vajda and McLoughlin, 2004) seems plausible. The fact of chitinous fungal remains found in the Late Jurassic onward and becoming abundant in the Cretaceous coincides with the rise of the angiosperms, and it is tempting to think that the development of abundant chitinous walls by fungi is somehow related to their exploitation of the flowering plants. "Spore" in the fungi is a far different concept from "spore" in embryophytic plants. There are many kinds of fungal spores: conidiospores, ascospores, basidiospores, etc. Some are sexually produced, others asexually. They may be single-"celled" or multi-"celled". Many of the things loosely called by paleopalynologists "fungal spores" are actually not strictly spores, e.g., ascocarps and ascomata. Also, pieces of chitinous-walled vegetative tissues of fungi occur as palynomorphs: hyphae and mycelia (see Fig. 1.2ao). It would be good to check the hypothesis that resistant-walled fungal parts are really always chitinous. The statement that they are is based mostly on the knowledge that chitin does occur in the Fungi and is a resistant substance. Fossil fungal spores are almost all derived from Ascomycetes. (Figs. 1.2af, ah. Range: Devonian (?) to present.) These frequently occur in paleopalynological preparations of marine rock, especially in Cenozoic sediments. They represent the chitinous inner tests of foraminifera, almost always of planispiral forms. The size range is very much less than that of the foraminifera from which they are presumed to have come. The jury is still out on the question of how they are produced and how they should be treated taxonomically: are they in general referable to particular existing foraminifera taxa (some certainly are), etc.? (See Tappan and Loeblich, 1965; Traverse and Ginsburg, 1966; Cohen and Guber, 1968.) The assertion that they are chitinous is based on the fact that the substance behaves and looks like chitin. In some papers, microforaminiferal tests are referred to as "Scytinasciae," citing Deak (1964), but I regard this as systematically unnecessary and not helpful. (Figs. 1.2aa-ae. Range: Lower Devonian to present.) Megaspores are the spores of heterosporous embryophytes, inside of the walls of which the megagametophytes develop. The common practice in paleopalynology is to follow Guennel (1952) in setting an arbitrary lower size limit at 200 ^m. The first such large spores occur in the Emsian stage of the latest Lower Devonian. They represent an evolutionary stage or "experiment" largely superseded by development of seeds, and reached the peak of their development in Carboniferous time. There have remained some heterosporous lycopsids and ferns producing free megaspores ever since, and hence fossil megaspores have been preserved in sediments. After the Cretaceous they are not abundant, but they can be common locally and paleoecologically useful. Chemical constitution is apparently sporopollenin. In fact, sporopollenin even occurs in some gymnosperm megaspores that are a developmental stage in producing seeds. Such megaspores are not dispersed as such but are encountered as relicts in developed seeds. N.B. Some palynologists use the term "mesofossil" for a particle of plant material larger than 200 ^m, clearly not a palynomorph, yet requiring microscopy for study, such as a tiny seed (Batten, pers. comm., 2003). As could be deduced from my definition of palynomorph, I regard the term "large palynomorph," used by some authors for things in the millimeter size range as an oxymoron. "Small palynomorph," for palynomorphs smaller than 200 ^m, on the other hand, is useful for referring to palynomorphs in that size range that are not miospores, such as some foraminiferal linings, for example. (Figs. 18.4-18.5a Range: Proterozoic to present.) Palynological preparations always contain more-or-less organic "junk" not referable to specific palynomorph classes. Coal petrologists and palynologists have made a virtue of this by studying the color and/or reflectivity of pellets of such things (plus palynomorphs) to determine the geothermal history of a sedimentary rock. Such material is collectively designated palynodebris. Four categories of such particles are especially common and are occasionally useful to paleopalynologists: (1) wood (tracheids, wood fibers, vessel elements), (2) cuticular-epidermal leaf fragments, (3) ubisch bodies (orbicules), and (4) variously degraded algal and other plant tissues. Wood fragments in palynological preparations can seldom be systematically identified, almost never closer than to a class, e.g. "conifer tracheids." Their abundant presence in a shale, however, usually indicates lagoonal or deltaic environment. When carbonized, such woody material is charcoal, and counts of the abundance of charcoal is sometimes an important environmental indicator. Cuticular fragments, especially if well preserved stomata are present, on the other hand, can often be identified. However, their identification is a complex matter, a field of its own, and few palynologists do more than report presence. Very abundant presence in shale usually indicates lacustrine or fluvio-lacustrine deposition. Some palynologists use relative amounts of cuticles, wood fragments, sporomorphs, dinoflagellate cysts, etc., for "palynofacies" (more specifically this is palynolithofacies) studies: (see discussion in Chapter 18). Ubisch bodies, also called orbicules, are tiny bits of sporopollenin about 1-5 ^m, which consist at least in part of sporopollenin left over by the tapetum in laying down the exine of spores and pollen. They are occasionally abundant in paleopaly-nological preparations. I am not aware that they are at present regarded by anybody as indicating much paleoenvironmentally. Degraded algal and other plant tissues can sometimes indicate probable marine deposition. The total organic content of sedimentary rock found in palynological preparations is called OM for organic matter, and it can be sub-classified into categories that include the sorts of things mentioned above, as well as amorphous organic matter (=AOM, degraded plant and animal structures, which can be abundant in some sedimentary rocks). Figure 1.3 Range of occurrence in time of all major categories of palynomorphs, derived from the current literature. "Cuticular remains," column 8, refers to plant cuticular coverings. Depending on interpretation of problematic structures, such structures go back to early Silurian. "Pv2" after "striate pollen" means bisaccate. Striate (= taeniate) pollen other than bisaccate ranges to the present. morphology the calcareous nannofossil taxon, Braarudosphaera, although five times as large. They presumably represent a stage in the life cycle of some algal species, and they must be considered palynomorphs, although nannofossils are not. Doubtless there are more such surprises in the rocks, but it is by now pretty certain that the major groups of things belonging in the palynomorph category are those mentioned in this chapter. 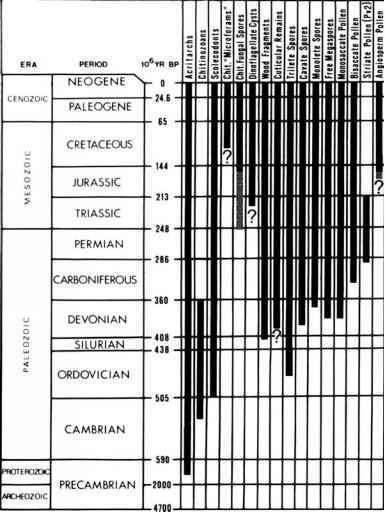 The general stratigraphic range of palynomorphs is shown in Fig. 1.3. A liberal view of what is a palynomorph is assumed, in order to be as complete as possible.